October 14, 2016, 5:25 p.m. The High Court is currently considering whether the Prime Minister has the legal right to invoke Article 50 – thereby triggering the beginning of the process for withdrawal from the European Union – without having to have a Parliamentary vote. Many who voted Leave at the referendum believe that the case is not about Parliamentary sovereignty – as those who have brought the case about suggest – but a way of overturning the result of the referendum. Whilst the voting public backed Brexit by a rate of 52% to 48%, three quarters of MPs backed the campaign to remain in the European Union. If responsibility for invoking Article 50 rests with Parliament, so the thinking goes, then Brexit can be blocked by having MPs vote against it. But what does the public think about that? New research by YouGov shows that the majority of the public believe the decision on Article 50 is the Prime Minister’s to make. 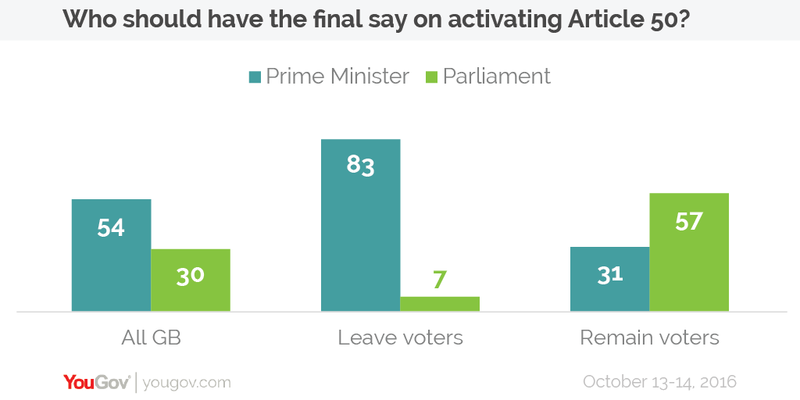 Just over half (54%) say that the Prime Minister should be able to activate Article 50, compared to 30% who believe that the power to activate it should rest with Parliament. A further 17% of people don’t know. Leave voters overwhelmingly back the PM’s right to call the shots on Article 50 by a rate of 83% to 7%. By contrast, Remain voters are much more likely to say that Parliament should make the decision, but the gap is much narrower at 57% to 31%. Broadly speaking, those groups that want the Prime Minister to make the decision were those who tended to back Brexit at the referendum, whilst those who say it should rest with Parliament backed Remain. Those groups that don’t follow this trend are 25-49 year olds, middle class people, Liberal Democrats and Scots – all of which tended to favour Remain at the referendum but now back the PM to decide on Article 50. The first two strongly back the right of the PM to make the decision, whilst the latter two are more narrowly in favour (and are subject to small sample size caveats).